The last bank outside State ownership wants to save as much as it can of the €2.6bn it owes in subordinated bonds. BANK OF IRELAND has announced plans to enforce ‘burden-sharing’ on its junior bondholders – in moves that could save the State around €2bn. The bank has confirmed this lunchtime that it plans to launch a “liability management exercise”, aimed at enforcing major haircuts on those who hold subordinated bonds on the bank. The bank’s statement said it still had about €2.6bn in total liabilities to such bondholders. Those bonds are not covered by the State’s bank guarantee – meaning the bank is free to try and negotiate a deal with them. Though a total saving cannot be immediately estimated, the bank said it expected the cash prices it paid under the exercise to be 10 per cent of the face value in the case of Tier 1 securities, and 20 per cent in the case of Tier 2 securities. The bank also said it would not be paying any interest due on those bonds. Alternative measures to be put to junior bondholders include the option for investors to swap the bonds for shares in the bank, or a proposal to grant a ‘call’ option allowing the bank to buy back the bonds at values slightly lower than those mentioned above. In its statement, the bank said it understood that the Government was willing to take whatever steps it considered necessary to maximise burden sharing with bondholders in banks. The move is an attempt by Bank of Ireland to stop the State having to cover the entirety of the €4.2bn that it needs in further capital, on foot of the last round of stress tests concluded in March. Similar moves have also been confirmed this lunchtime by EBS Building Society and Irish Life & Permanent. In a statement responding to the plans, finance minister Michael Noonan said the plans were “the final market-based step to ensuring appropriate burden sharing” and said the bondholders would have been burnt in full had the State not recapitalised the various institutions. 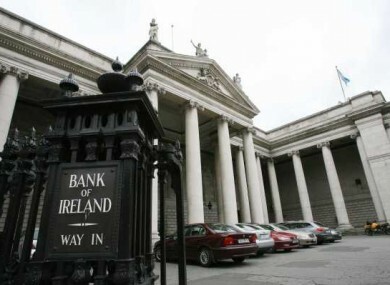 Bank of Ireland is the only one of the six institutions covered by the State’s bank guarantee, initially introduced in 2008, not to have become at least majority owned by the government. The State’s ownership of Bank of Ireland is thought to be around 36 per cent. If the bank issued new shares to give to junior bondholders in exchange for their bonds, that ownership would be diluted slightly. A group of junior bondholders in AIB is currently mounting a legal challenge against proposals to enforce such burden-sharing on their investments. That case is due to be heard on Thursday. Email “Bank of Ireland confirms plan to burn junior bondholders – and save us €2bn”. Feedback on “Bank of Ireland confirms plan to burn junior bondholders – and save us €2bn”.